As the general election campaign kicks off, my newsfeed is full of stories about alliances, rather than the policy issues that matter. The SNP leader Nicola Sturgeon was quick off the mark, indicating her support for a progressive alliance against the Tories, if the numbers stacked up. Of course this needs to be taken with a substantial pinch of salt and she well knows that such a call is damaging to Labour in England. A successful UK progressive alliance is not in the SNP's strategic interest, and they certainly don't want a left wing Labour government led by Jeremy Corbyn. The case for independence needs a right wing, hard Brexit Tory government, to encourage left wing Scots to despair of the U.K.
Jeremy Corbyn was quick to dismiss this notion, not that this will stop the Tories and the media playing the 'in Sturgeon's pocket' card if the polls narrow. He argues that the SNP is not a progressive party. Objectively, this is a bit harsh, even if understandable in an election context. The SNP is a progressive party on many social policy issues, it's in economic policy that their progressive claims are blunted. A binary election on unionist/nationalist lines suits the Tories and the SNP, as Brian Monteith argued clearly in the Scotsman yesterday. Then we have Compass, who argue that progressive parties shouldn't stand candidates if it ensures the regressive right win. I'm afraid this simply demonstrates how out of touch with reality Compass has become in recently years. There is neither practical support from the parties, any clear idea as to how this could be achieved, or what the programme might be. For completion, the same applies to the Women's Equality Party standing against 'misogynist' MPs. The NHS Party is even dafter, given the clear dividers between Labour and the Tories on the NHS in England. The next 'alliance' we are asked to support, comes from Blair (although he has slightly backtracked) and Mandelson who together with 'Open Europe' have adopted a 20:20 strategy. 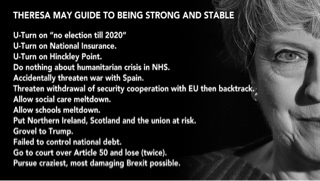 20 seats have been marked out for attack, as well as a list of 20 Labour, Liberal Democrat and Conservative MPs who have been advocates of the closest relationship with the EU. This 'alliance' is less clear how these MPs will act progressively in parliament if elected. In fact there is little in this alliance that looks in any way progressive. Alliances are not just a general election issue, they arise in the context of the council elections. Nicola Sturgeon has been attacked for hypocrisy in not ruling out coalitions with the Tories. Scottish Labour has also been under pressure to take a harder line on coalitions than they did in 2012. Here the issues are more complex. The proportional representation voting system in Scottish local government, makes it very difficult to achieve an overall majority. This means coalitions, or at least understandings, are a necessary evil. The issue for parties that claim to be anti-austerity is how do you do a deal with the Tories, even if it is of the Tory lite variety? All too often councillors focus on the baubles of office rather than a credible policy programme for their communities. At national or local level, pre-election alliances 'progressive' or otherwise are simply a non-starter. Of course, after an election, politicians have to handle the electoral cards they are dealt with by the electorate. But as Ken Loach said at the STUC this morning, 'I'm getting old so let's go for broke. We have one chance for a big change - don't lose it'. Time spent on 'progressive alliances' is simply a distraction from the important issues in this election. Forget it and focus on what really matters. As the local government election short campaign gets under way – let’s keep it local. Local government elections will be held for every seat in Scotland on Thursday 4 May. The first reminder is to make sure you are registered to vote. Changes to the system means that a lot of people have been missing from the register. If you haven’t received a polling card by now, you are probably not registered. It’s easy to do this online at https://www.gov.uk/register-to-vote, but it has to be completed by 17 April. The second reminder is that these are local elections. The councillor you elect will make important decisions about local services including schools, social care, roads, libraries and much more. While I am not naive enough to believe that national issues don’t impact on local elections, I get very irritated when leaflets arrive through the door with the local issues relegated to an afterthought. – I bin them. UNISON Scotland has published its manifesto for the election. There are some general themes around fair funding and the importance of keeping services local, as well as more detailed ideas around individual services. We will be highlighting some of these, and the people who deliver them, during the campaign because we all tend to take these services for granted. I take some comfort from a poll we commissioned from Survation this month that voters do care about local services. 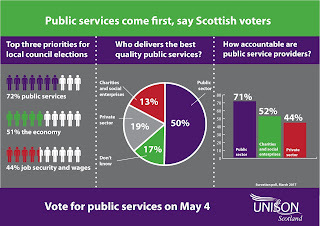 Public services are the top priority for voters (70%); and half of all voters chose the public sector as the best to deliver our public services, only 19% chose the private sector and 13% chose charities. 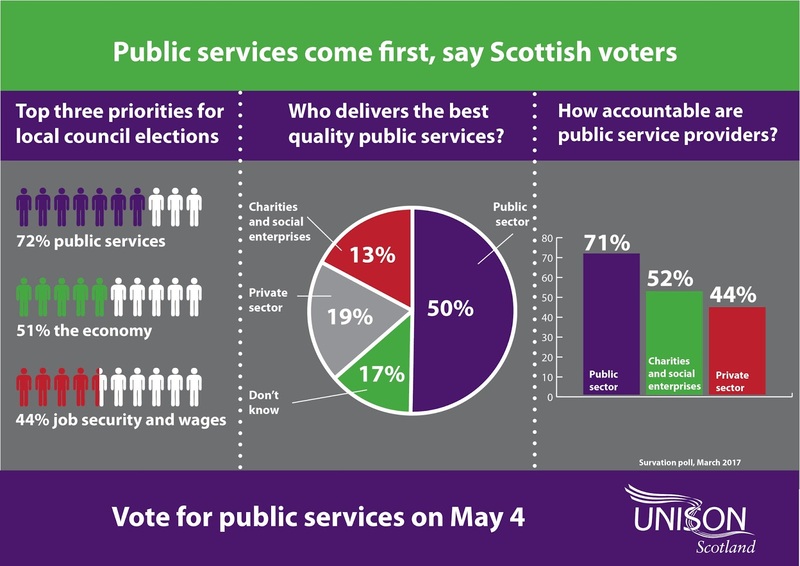 This included Conservative voters with only 31% saying the private sector and 10% saying charities are the best place to deliver public services. 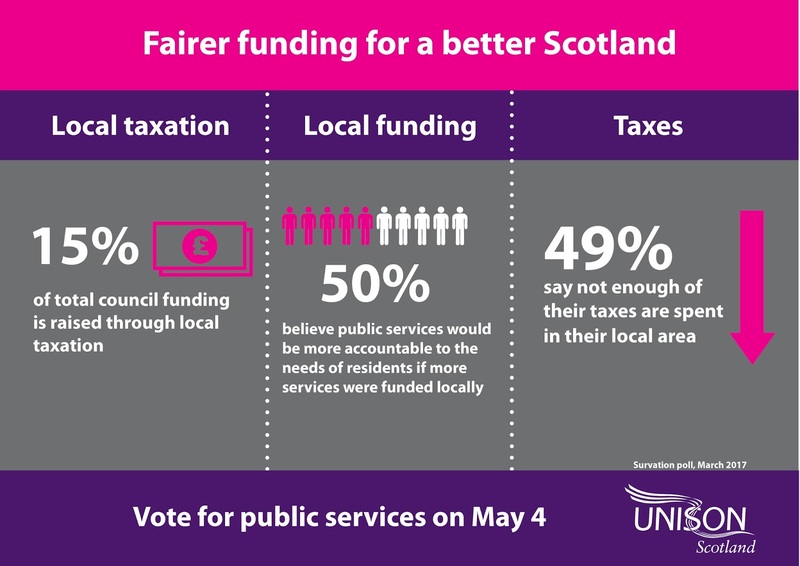 That’s a clear message to council candidates from all parties that people in Scotland want high quality services, delivered by public sector staff. That doesn’t preclude other service providers, but in-house staff should be the primary means of delivering public services that are accountable to the public. There was also support for keeping services local, with the council being the most trusted deliverer of local services. 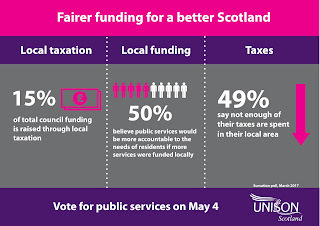 Voters also wanted more of their taxes spent locally. They also recognised that the cuts have had a serious impact on the quality of public services. Hardly surprising when nine out of ten jobs lost in Scotland’s public sector since the austerity cuts have gone from local government. We will be providing some useful questions for candidates in the coming weeks. So if a candidate chaps on the door - start by asking them, not what they have been told to say by central office, but how they will be standing up for local services. Keep it local.